Happy Fiesta Friday #26, you guys! I am SO honored to be co-hosting this week’s party with the lovely Prudy@ButterBasilandBreadcrumbs. She’s one of my closest blogger buddies and I can’t think of anyone else I’d rather co-host with. I hope most of you guys that are following me are joining in the fun with us- if you’re not, you’re just really missing out. Go ahead and click on the picture link at the bottom to find out how you can link up with us, we’d love to have you. As this is my first time hosting, I wanted to make my contribution to FF a special one and I really think I succeeded with today’s post. When I shared the recipe for Banana Yogurt Popsicles, I said that it was based upon an original recipe for Southern Style Banana Pudding that my grandma makes for our family, albeit, a more ‘healthier’ version. I received a lot of requests from you guys asking for the real thing, and because I love when people ask me about food, I decided to go ahead and make some for a photoshoot to share on the blog. I’ve already shares several of my grandmother’s recipes with you guys, but I never really went into any detail about the cook behind this oustanding food that I was blessed enough to grow up with and in turn, learn to make myself. Behind all food is a story and here is no exception. Yesterday I called up my grandma to ask if she’d mind if I shared a bit of her story, and fortunately she said it was okay. I’d love to share some of the story with you guys, if that’s okay. This is my grandmother, Selma Leander Sanders. She’s my mom’s mom and probably one of the strongest, bravest people I’ve ever met. Her smile and laughter are some of the most beautiful things I’ve ever seen. 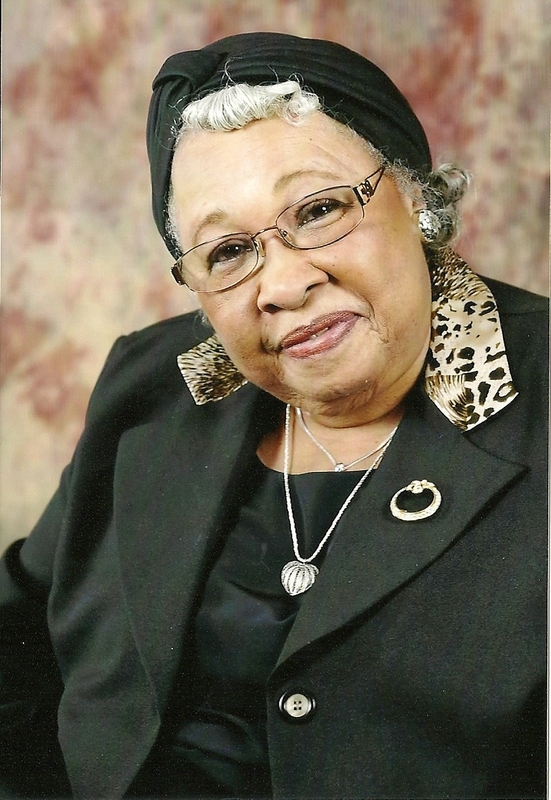 She’s the first of 3 daughters born to Isaac and Lily Mae Haynes 79 years ago in Carson, Mississippi. Isaac was unique among many African Americans in the Jim Crow South in that he not only owned his own land, but also employed black and white laborers to help work his farm that Selma and her sisters grew up on. I only met him once in my life and by that time he was in his nineties and ailing in health. But my Mom tells me that when he was younger, he was a real riot, always telling funny stories and playing practical jokes. He was a real family man, willing to do any and everything for his children. My great grandmother Lily was very quiet and reserved. She died before I was able to meet her, but my Mom said that she had an uncanny sixth sense about everything. If you were having a bad day, she’d call you and ask if everything was alright. My grandma definitely inherited that from her, she can take one look at me and know whether or not something’ wrong with me or not. My grandmother attended Alcorn College, where she met my grandfather, Willie John Sanders. (Random fact: my grandfather attended Alcorn at the same time as Medgar Evers; he still has his yearbook and Medgar Ever’s picture is right there. How cool is that?) When they married they, like many Black people in the South at the time, migrated up north where there were more employment opportunities in the car assembly plants. After settling in Lansing, MI, my grandparents soon began having children of their own; three daughter to be exact. While my grandpa worked at the GM auto plant, my grandma worked at home as a homemaker and mother to their children. There, she consistently cooked and baked both simple and elaborate foods for her family, that they still rave about to this day. My grandma’s cooking is the reason why never had any problems with eating my vegetables growing up as a kid. My grandpa is 80 and she’s 79, and to this day they still keep a vegetable garden in their backyard that we all love to eat from. One of the only foods I could eat every single day for the rest of my life and never get tired of is a bowl of cabbage greens from the garden, with a hunk of her cornbread- literally one of the best things I’ve eaten in my life, hands down. My grandma knows how to make stuff that would make both inexperienced and experienced home cooks break out into a sweat. When I first began seriously cooking for myself, it was one of my greatest hopes that I would someday, somehow get proficient enough to be able to pull off her ‘signature dishes’; the foods that we as a family always attribute to Grandma and all look forward to eating whenever we see her. To date, my proudest moments in the kitchen have been when I’ve succeeded when trying out some of her recipes. She’s getting up there in age and there are times when she doesn’t feel as able to make some of the more complicated things that she used to when she was younger. I’m grateful that I’ve taken the initiative to learn how to do these things myself so that the tradition of her food can continue to be enjoyed by our family without exhausting herself. 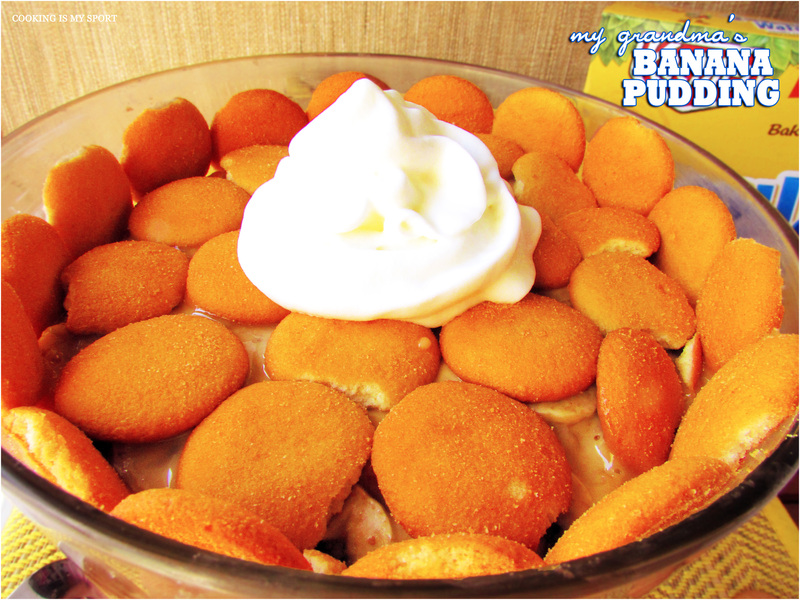 This Banana Pudding is one of her best ‘signature dishes’. I recently made it for the 4th of July and when I took it over to her house for dinner, I received her stamp of approval-which is how I know for sure that I did it right. The custard is definitely the star of this banana pudding. It’s sweet, smooth and the ‘glue’ that makes the wafers and bananas mold together perfectly. Guys, this stuff is so good, you won’t even have words. You’ll just sit there, shaking your head back and forth as you keep spooning the pudding into your mouth. That’s what everyone at the table was doing when I last made this, and I’m pretty sure that it’s the same thing you’ll be doing too. 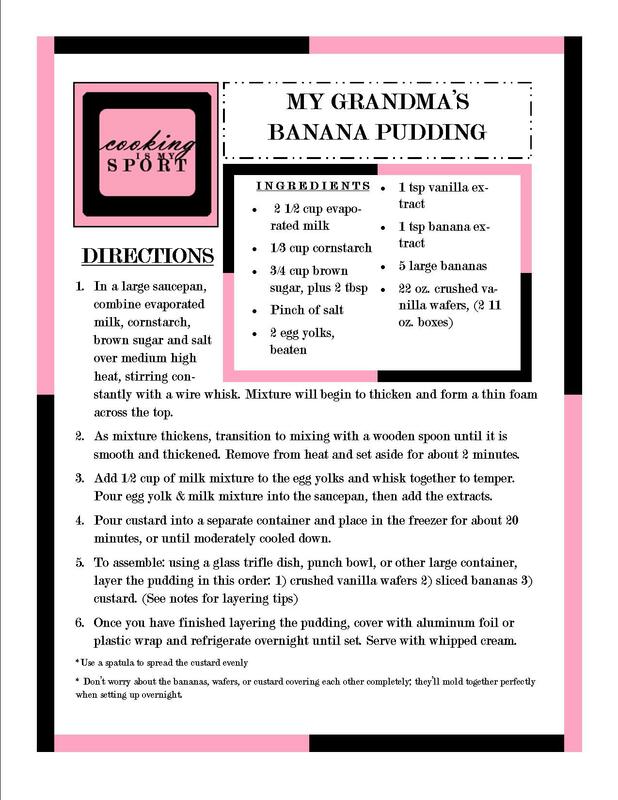 Even people in my family who don’t really eat bananas love this pudding. I’m super psyched and proud to share this recipe, as well as the inspiration for my cooking at today’s Fiesta Friday- because it all really does start with my grandma. 1. In a large saucepan, combine evaporated milk, cornstarch, brown sugar and salt over medium high heat, stirring constantly with a wire whisk. Mixture will begin to thicken and form a thin foam across the top. 2. As mixture thickens, transition to mixing with a wooden spoon until it is smooth and thickened. Remove from heat and set aside for about 2 minutes. 3. Add 1/2 cup of milk mixture to the egg yolks and whisk together to temper. Pour egg yolk & milk mixture into the saucepan, then add the extracts. 4. Pour custard into a separate container and place in the freezer for about 20 minutes, or until moderately cooled down. 6. Once you have finished layering the pudding, cover with aluminum foil or plastic wrap and refrigerate overnight until set. Serve with whipped cream. * Don’t worry about the bananas, wafers, or custard covering each other completely; they’ll mold together perfectly when setting up overnight. The banana pudding indeed looks delicious!! 🙂 Happy FF, Jess! this dessert always brings back such wonderful memories 🙂 thanks for sharing, Jess! I’m excited for this recipe. After you mentioned it a few weeks ago, I’ve been looking forward to it. 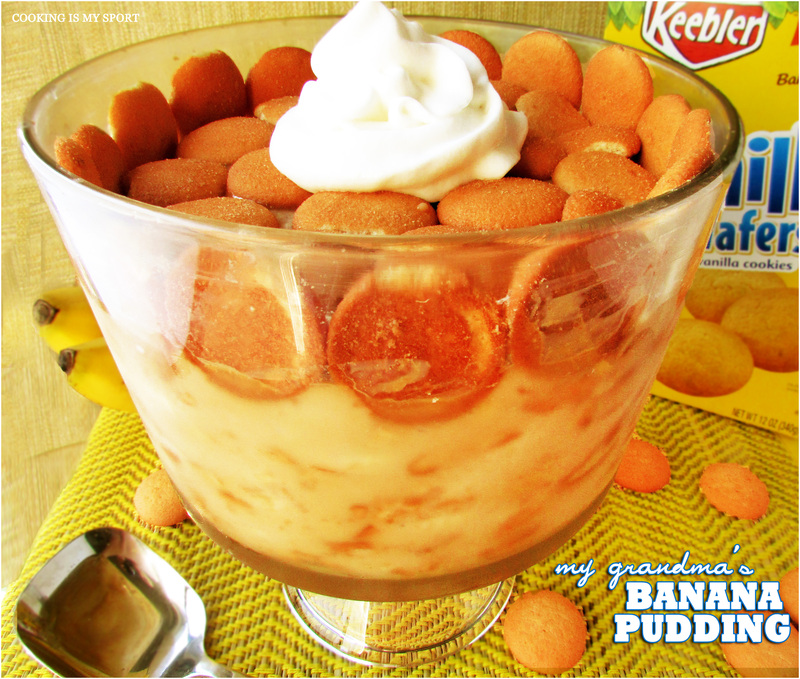 This banana pudding look so delicious. Now I just have to find banana extract. Thanks for sharing stories about your grandma. I feel like I know you so much better now. =) Congratulations on being co host! So excited for you! Thanks Andrea, I’m so excited to be co-hosting with Prudy, it’s a real honor. Jess, it’s wonderful that you have taken the time to find out about your family history – these days, so many people don’t seem to have much idea of their roots beyond their grandparents. Mrs Sanders has the most beautiful smile and such kind and twinkly eyes. I love that you have taken the mantle; the wooden spoon, as it were, from your Grandmother (we have the same name!!) to continue her formidable cooking traditions. Thank you for sharing her story and yours as well as this recipe. I am bookmarking this one for later in the year. …so now I am wondering about the recipe for those cabbage greens…Have a wonderful time hosting your first Fiesta Friday and don’t worry about replying to comments on your post today – you can catch up with that later! This is such a sweet post, Jess! Your Grandma sounds like a wonderful lady. That’s a perfect description of her food Lily- thanks, Happy FF! Such a lovely twinkle in your Grandma’s eyes – she’s beautiful. She must have been so proud of you when you re-created on of ‘her dishes’ to share with the family. Oh Jess I loved the story of your Grandma and Grandpa and she is a beautiful and amazing woman. The banana pudding with nilla wafers is something I haven’t had in a while but remember from my childhood I love it and that cabbage with cornbread sounds great too! You mean it hasn’t been torturous? Lol. If I knew that was a secret wish of yours, I would have asked you sooner! I sometimes don’t ask thinking I’d be imposing, so I pretty much stick with those who volunteer. What a wonderful story Jess. I loved reading it. We love Banana Cream Pie and I’m due to make some. Thank you for sharing the recipe. I am going to make it just like this for my son. He’s going to love it! Oh trust me, if you love Banana Cream Pie, you will FLIP over this pudding. Thank you! NOTHING like it! Thank you! I love what you said about your grandma, her cooking, and especially her vegetable garden! 🙂 Thank you for hosting FF this week too!! Have a great weekend! I'm so happy that you're learning to make her recipes….that's something that I'm sorry that I didn't try hard enough to do with my grandma, and I'm so sorry for that! This banana pudding is outstanding. I totally want to make this….and I'm thinking the fuss budget just might like it! Thank you so much for sharing the pudding…your family…your grandma with all of us. What a beautiful post. Gorgeous photos.. awesome recipe. 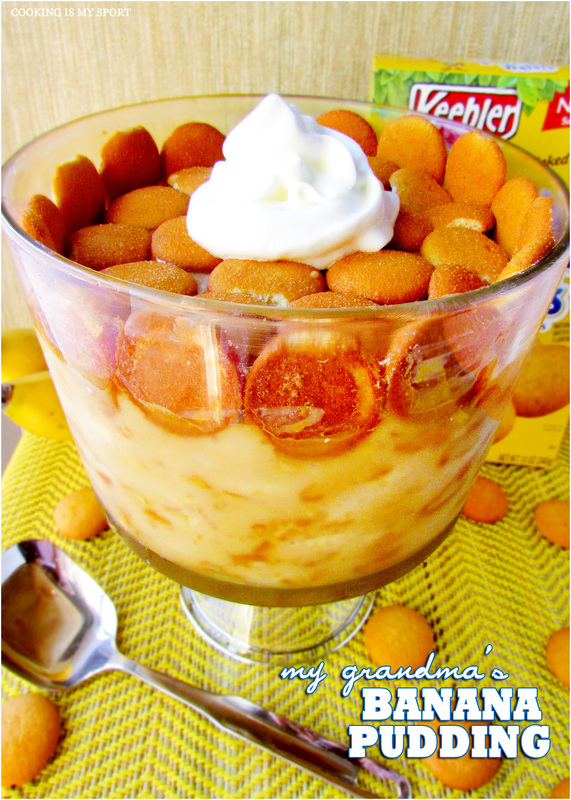 By the way… my grandma used to make a banana pudding with nilla wafers too!! Haha!! I can vaguely remember sitting around her table, and we'd all get a little dish of it… 🙂 Happy memories. I think even the pickiest eaters would love this-I used to be one when I was little and I still couldn’t turn it down! They are, aren’t they? Thank you! Thanks for hosting FF.. and what a great post! Thanks for having me, I appreciate this a lot! Beautifully written, wonderful story (amazing woman) and scrumptious pudding! Oh Jess so sweet of you to share your grandma’s story just enjoyed reading thru and she looks beautiful and loved her smile. …The pudding looks awesome. …keep rocking. .. I loved your story! I am always so interested in family history. I also inherited my love of cooking from my grandmother. Like your grandmother, she was king and tough enough. Thank you for sharing! I think Southern Banana Pudding is something everyone’s mom or grandma made for them at some point- it’s the perfect home/comfort food, for sure. Thanks Arlene! I was happy you were hosting for my very first Fiesta Friday! I have already met some wonderful people including Prudy! Prudy’s the best. Period. I was super psyched to co-host FF with her. Thank you! Jess, love your grandma, love your story, love the banana pudding. Loved reading through you post…Your grandma sounds soo much like my grandma!Grandmas are the best isnt it! !Love your biscuit pudding.Great pics Jess! Grandmas are the absolute best- thank you! What an ode to your grandmum! Her smile is infectious. I am so glad you learnt so much from her. God bless you both. This was a wonderful, beautiful read, Jess! Your grandmother sounds like a truly special woman, and I’m really glad to be get to “know” her just a little through your post, and through this wonderful recipe of course! I can’t wait to try to make this pudding! Happy FF! Thanks, Happy FF to you too! What a wonderful post, Jess. It’s so lovely that you shared your story with us and the wonderful banana pudding. We came for the banana pudding but what’s even better is we got to know such wonderful people! 🙂 Happy FF & thank you for co-hosting! Your grandmother is just so beautiful. And I think I love the sound of her cooking – cabbage and cornbread, banana pudding, all those veggies. What a lovely post. Your grandma is amazing. I hope you showed her this post so she knows just how amazing you seem to think she is. I said several times that have a blog means a lot of things. Heard about new ingredients, about new food habits or meet new people is very interesting and makes the “blogger-life” funnier. But, in my mind, in my heart, blogging means even discovering new things about ourself, become aware of some little things we didn’t notice and, like in your post, have the chance to thank someone we love very much. I’m sure your grandmother (she looks so sweet!) is really proud of you, her pudding btw looks delicious. I hope you had great time co-hosting. Your grandmother is my kind of cook. Such a beautiful photograph of her. My gran who I call nan was 80 this year and she’s amazing in the kitchen too. I understand how much your grandmother means to you. Emma. Beautiful post, Jess! Your grandma is a beautiful woman and her banana pudding looks delicious!